Shade loving annual that is grown for its colorful foliage. The flower is insignificant. Ideal as a bedding plant, in containers, hanging baskets, garden borders or as a windowsill plant. 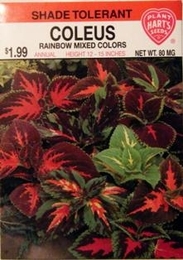 Coleus may be grown in pots and windowsill all year round. Planting time - Early spring or indoors 4-6 weeks earlier.